Planting a tree is one of the best ways we can provide a lasting gift to future generations. Growing the tree canopy is a worthy mission, and it is important to know the best practices involved so a tree planting is successful in the long-term. Though it might just seem as simple as digging a hole and sticking a seedling into the ground, there is a lot to consider when planting a tree. Just as cars need regular service, houses need maintenance, and pets need food, shelter and exercise, trees require a thoughtful plan for planting and then ongoing care and upkeep. Otherwise, a tree may be susceptible to drought, disease, pests and other hazards. There are many factors involved when planting a tree. It is important to select the right type of tree for the conditions, and you must consider elements such as the amount of available sunlight, proximity to water and buildings, and quality of the soil. Learn more about where to plant: Right Tree, Right Place. Once you have selected the type of tree and considered the variables about where to plant, it is important to know proper techniques for planting and then maintaining the tree. Adequate care is vital to the long-term viability of a newly planted tree. Even with proper care and maintenance, trees can still be susceptible to adverse environmental influences. This might be in the form of drought conditions, incursion by invasive species and the arrival of pests. Learn more about Avoiding Tree Damage During Construction. Taking care of your mature trees promotes tree health and structural integrity, ensures a tree’s value will continue to grow, and prevents the development of more costly problems in the future. Pruning is the most common tree maintenance procedure. It is important to understand the pruning needs of mature trees and to practice proper pruning techniques. 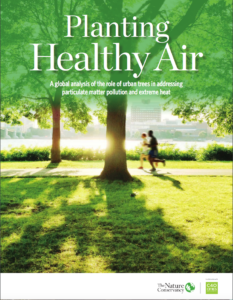 A global analysis of the role of urban trees in addressing particulate matter pollution and extreme heat. Click below to view the report then visit The Nature Conservancy website to read more information. Charlotte is faced with a growing population of fall cankerworms, despite aerial spray efforts in recent years. Now more than ever, it is vitally important for residents to band their trees each fall. By continuing to band our trees, we can prevent the cankerworm population from increasing to an unmanageable level. A common, native pest of hardwood trees, the caterpillars can cause defoliation in our tree canopy. When cankerworms hatch, many descend on silk threads, get caught by the wind and “balloon” to surrounding trees. They prefer Willow Oaks, but feed on more than 50 other plants, after which they drop to the ground, burrow and form a cocoon. If you are concerned about small trees and shrubs in the yard, talk to your garden center folks about sprays – follow directions carefully. An arborist can be consulted about larger trees. The best defense is banding with tar paper and Tanglefoot in early fall. The City of Charlotte offers a matching program for tree banding, and neighborhoods can apply to Charlotte’s Neighborhood Matching Grants Fund for up to $3,000 toward banding trees. The City of Charlotte provides additional information about cankerworms and tree banding, including retailers with tree banding supplies, and an online pre-application workshop. Proper tree care is an investment that can lead to substantial returns. Knowing the right methods for care is essential to ensuring a tree has all it needs to prosper. The Emerald Ash Borer is a non-native invasive insect that has already killed tens of millions of ash trees in North America and is slowly but steadily moving into areas of North Carolina. Susceptible trees in North Carolina are green ash, white ash, Carolina ash, pumpkin ash and white fringetree. This beetle can spread naturally (by flying) or through the accidental, human-facilitated movement of infested material such as firewood or ash timber. 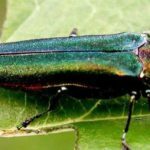 The North Carolina Forest service developed a map that tracked detections of the Emerald Ash Borer in the state, including Lincoln and Iredell counties. For more information about the Emerald Ash Borer, click here.